Regarding the legal selections my classes usually end up debating between free speech and bureaucracy, which makes for some lively conversations. Bureaucracy gives them an added bonus of gold, etc, but being middle schoolers they believe free speech is paramount to their existence. The debates usually get heated, but in the end free speech wins out. This issue will cause waves with the Mother Country, who will start putting people in jail for speaking out against the King or Queen. My kids always send messages that they have rights to freedom of speech that usually results in more people being put in jail. When we place people in jail I just have a section of the class that is for students who are in jail. They sit there until they are released or it gets to crowded. Normally, the jail fills up and then the people revolt, freeing the prisoners or the House of Burgesses votes to release all the prisoners. The next big issue is discussing slavery. This topic takes the longest to discuss and you would think that most students would be against slavery because it is wrong. However, almost every year my classes end up with a 50/50 split. I suppose some people might think even letting them debate slavery as something they can use is uncouth, but in reality this helps them understand why people used slavery in the first place. The biggest reason classes adopt slavery is because of the economic values that it brings at that early point in the game. This year I had the two classes say they wanted the point values and they also felt that it is just a game. No one was really enslaving another person so they felt it was not immoral. (Let me be clear on one thing: I DO NOTHING TO PROMOTE SLAVERY! THEY CHOOSE BASED ON A SET OF CRITERIA THAT THEY SET THEMSELVES. I ALWAYS TAKE THIS AS ON OPPORTUNITY TO DISCUSS WHY SLAVERY HAD BECOME SO IMBEDDED IN AMERICAN SOCIETY.) Other classes were steadfastly against ever even simulating slavery in their classes because it was a huge injustice. I also had classes that passed laws that only describe what kinds of slavery may be practiced, such as capturing workers during war. Once slavery has been adopted it culturally stays a part of that class until the end of the year when we get to the civil war the battle lines have been drawn. When it comes to the economy, I always start them on Mercantilism. At first they are ok with this development, but over time they become angry. They want to trade with other nations, but the Mother country won’t let them. This always results in the classes no longer listening to the Mother Country and they begin to smuggle goods and technology that will give them the edge. Once they are free I let them use the free market economy, which gives them a boost and allows them to trade more with other classes. I do not do anything with state property or environmentalism, since it is not an issue we talk about in my class. I think over the years I have only had 1 class want to use either one and that was when I was discussing communism when I taught 9th grade. The religion category also arouses many passions. I let them choose any of them, but the discussion always ends up around organized religion vs free religion. 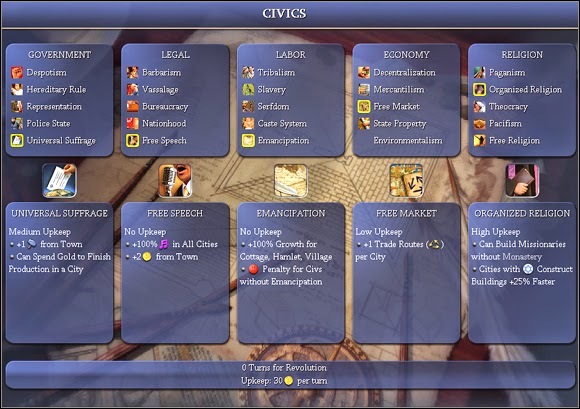 In the past I have tried to get them to want to create a theocracy and I had one class create one, but most of the time the students want to be able to choose the religion they please. I also let them create their own religions, which has resulted in all kinds of different things and bibles being written with some interesting sacraments. One of Mr. Parry’s classes once created a form of communion where they brought Oreos in for everyone to eat once a week. The students always draw from their own religious experiences, but when it comes down to it they all want religious tolerance so they choose free religion. Using the Civics portion of the game is a really cool way to have discussions about the issues of colonial life. I always bridge the gap between the decisions that we were making vs the decisions that colonial people had to make. The students also have a stake in what they choose because it will provide different bonuses it gives us a reason to be discussing them, which makes student participation abound.